Track important user metrics and run several effective campaigns simply by integrating the Swrve SDK and enabling push notifications. These tasks can be completed by a single engineer in less than a day, and allow your marketing team to do the rest. Nurturing – Remind new and evaluating users that they have downloaded your app, and reference the value your app offers. Nurturing campaigns help increase user retention, and prevent evaluating users from lapsing. Re-engagement – Bring users back into the app by asking relevant questions. When executed correctly, re-engagement campaigns are great for converting lapsed and disappearing users. 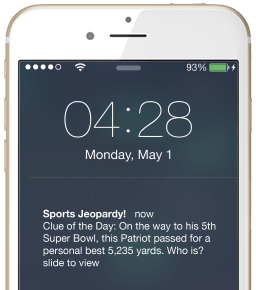 Real world events – Prompt users with messaging relevant to real world events or to live promotions that they may be interested in. 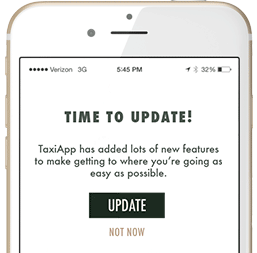 This is a great way to remind users of your app’s value and incentivize them to keep your app installed. New app version – Encourage users to download the latest version of the app at session start. This is a great opportunity to highlight the benefits of your app, and to emphasize that you’re working hard to improve it. Rate my app – Ask frequent users if they’d be willing to rate your app. This will help increase your app’s rating, which can fuel a whole new level of organic growth as it becomes more discoverable and attractive to potential new users. Nurturing – Involve evaluating users every couple of days by highlighting the app’s different features when they open the app. This will help users understand the full value of your app, and ultimately increase conversion. Swrve makes it easy to optimize your campaigns to ensure that they’re resonating with users and consistent with the tone of your brand. You can create separate versions of in-app messages with different imagery and button placement, and gauge which one prompts the most conversion. Similarly, you can create different copy for push notifications, and see which version drives the most session starts. Whether you’re preparing a 24 hour promotional campaign that starts next month, or launching a nurturing campaign today, Swrve gives you the ability to send push notifications at the optimal time: you can schedule the push for the same moment worldwide, at the user’s specific local time, or at the user’s optimal time of engagement. Running these campaigns and gathering these key metrics are possible because Swrve automatically sends certain events and user properties once you have integrated the Swrve SDK. With Swrve, you only need one line of code to start gathering user data and launch several effective campaigns. This saves your development team from having to build an expensive analytics platform, and allows them to focus on building your games or apps. By integrating with Swrve, you give your marketers the ability to track user behavior through one, easy to use platform. Our knowledgeable mobile marketing strategists will work with one on one with your team to create compelling campaigns that move the needle on your app’s key KPIs, smash your mobile objectives, and help you achieve maximum ROI.